Denver native Emily Howell Warner took her first airplane flight as a teenager and came away from that experience with a passion to fly. Immediately, she knew she wanted to become an airplane pilot. Emily Howell was born on October 30, 1939, and attended Holy Family High School in Colorado. She started flying in 1958, and after amassing her private, commercial, and flight instructor certificates, and instrument and multiengine ratings, she went to work for Clinton Aviation Company as a flight instructor. 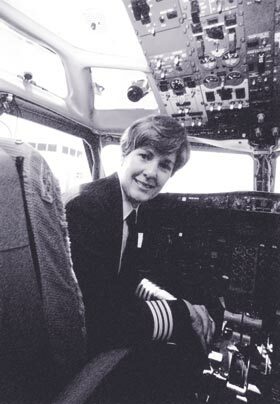 In 1973, sixty-seven years after the "Wright Flyer" made aviation history and fifteen years after her first plane flight, Howell Warner also made aviation history by becoming the first woman hired as a pilot by a major U.S. airline. On February 6, 1973, Howell Warner served for the first time as second officer on a Boeing 737 for Frontier Airlines on a flight departing from Denver's Stapleton Airport. Prior to her groundbreaking flight, Howell Warner had been active in the aviation industry for more than twelve years. During that time, She amassed more than 3,500 flight hours and became the first woman ever to be appointed as a designated FAA pilot examiner. Commerical Pilot Emily Howell Warner, the first woman to pilot a scheduled-passenger airline. Her landmark flight took place in 1973 aboard a Frontier Airlines 737. Three years after serving as second officer for the first time, Howell Warner earned her captain's wings and was the first woman to do so. Today, with more than 21,000 flight hours (more than any other woman pilot in the world), Howell Warner is a Federal Aviation Administration Aircrew Program Manager, assigned to United Airlines' Boeing 737 Fleet. She is also the FAA representative for United's Flight Safety Action Program. Emily Howell Warner opened the door for thousands of women pilots and has been a personal mentor and role model to many. Along the way she won almost every aviation award given, including the Amelia Earhart Award as the Outstanding Woman in U. S. Aviation. She was also the featured speaker for the United Nations Kickoff Dinner for International Women's Year. In 1983 she was inducted into the Colorado Aviation Hall of Fame and was a 2001 inductee into the National Women's Hall of Fame in Seneca Falls, New York. Her pilot's uniform now hangs in the Smithsonian Institution's Air and Space Museum in Washington, D.C.